After the Act XIII held on Saturday, February 9, we can witness that the movement is still holding and will not falter by spring. Too many people have now understood what is at stake. Between 50,000 demonstrators, according to government figures, and 250,000, according to the figures of a police union have rallied all around France and not just in Paris, as the corporate media, all centralized in Paris, want to believe. As for the rest of the population, the latest survey, according to the French version of the Huffington Post, shows that 64% of the French people support the movement and 77% find it useful. The attempted counter-demonstration in support of Macron, called the Foulards rouges [the Red Scarves], took place on January 27th and gathered only a few thousand people, all in Paris and nobody in the provinces. For now, the main concern of the demonstrators is police violence, as evidenced by the many amateur videos filmed by the demonstrators themselves and posted on social networks. Lost eyes, exploded hands, skull fractures, the CRS [the equivalent of the SWAT] no longer hesitate to shoot the demonstrators at close range with their grenades and other so-called defensive weapons. Once again, act XIII ended with a ripped hand and many wounded. Conducting such a census gave me the impression that journalists are targeted and not protected by the police. This has just been confirmed by three journalists who say they have been voluntarily targeted by the CRS during act XIII. An analyst compared this yellow vest movement to the demonstrations that shook the Paris suburbs in 2005, where very aggressive young people did not hesitate to attack the police directly. However, there were very few injuries during these demonstrations because the anti-demonstration police were trained, and well trained, for this purpose. It therefore appears that since this is not the case for the Yellow Vests demonstrations, the police did receive orders to be particularly violent against them. This analyst believes that the intention is to terrorize the demonstrators so that they will not dare to leave home the following Saturday and that the movement will run out of steam on its own. However, the Minister of the Interior has been recorded saying "I don't know any police officer nor gendarme who has attacked Yellow vests", showing, once again, to the French population either his taste for lies or his filthy ignorance of the reality on the ground; both of which are a major flaw for a Minister of the Interior. The Human Rights League is trying to have the use of these offensive weapons banned by the CRS, but the High court has refused to do so, showing that the elite in the judiciary is not on the side of the people too. Hundreds of demonstrators has been arrested and put in custody just because they were demonstrators. Their lawyers has condemned the hastily procedures used by the justice against them. At the same time, Macron launched what he himself calls "Le Grand débat" [the Great Debate], a debate that consists of touring France and discussing with the mayors, which leads his opponents to say that he is campaigning, at the expense of the state, for the next European elections, elections that polls show to be favorable to those whom the mainstream press calls "the populists", i.e. those against whom Macron is fighting. While the first debates, broadcasted entirely on television, had attracted a lot of curious spectators, their audience has rapidly decreased. Nothing has emerged from this Great Debate so far and a large majority of the French (60%) believe that it is a simple smoking screen from which nothing will come out. As for the Prime Minister, he just submitted to the parliament an "anti-hooligans law" which, in his opinion, is "not at all a law due to the actual conditions" but a law to allow demonstrators to demonstrate in complete safety; as if it was the hooligans and not the CRS who were threatening the safety of the demonstrators. This law will allow any police officer to register any person "suspected of being a hooligan" in a protest ban file, the suspicion being sufficient. The same kind of file already used against football hooligans but not on mere suspicion this one. Internationally, the Italian government has ostensibly shown its support for the Yellow Vests and the Italian Prime Minister has even met with them. An angry Macron reacted by recalling the French ambassador to Italy, something we have never seen since Mussolini, and accuses the Italian government of interfering in French internal affairs. To which the Italian government replied that at the time of the last Italian elections, Macron had ostensibly expressed his support for the opposition, so why not return the favor? So nice for the united European Union. For Act XIII, a group of French Yellow Vests wanted to cross the border to meet an Italian group and show that if their two governments are no longer friends, the two peoples continue to be. The police prevented them from crossing the border. To add another layer to the infamy of this government, it is now entangled in a particularly gloomy and really bizarre scandal: the Benalla affair. Benalla is supposedly a simple security adviser/bodyguard for Macron, but the total protection offered by his boss indicates that he would be much more than that. Benalla, a 26-year-old man, has been filmed violently hitting a demonstrator in the street. As Benalla does not belong to the police, it is indeed an act outside the law that is involved, an act of violence against an individual who has not attacked him. Indignation in the population. Macron is forced to speak and claims to have fired him immediately. However, a few weeks later, the same Benalla was caught leaving for Africa, with a diplomatic passport, to have interviews with some high-ranking personalities. New public outrage. How can a person who should be in prison, who would only be a simple bodyguard, could hold a diplomatic passport and meet African personalities, on behalf of the French state since he benefits from a diplomatic passport. It smells really bad. Embarrassed and incomprehensible explanations from the government but only symbolic actions taken against the bad guy. The case seemed to be getting a little forgotten, especially since all the attention is focused on the Yellow vests, when Boum, the case flares up again and then the stench is suffocating. One of the few remaining somewhat independent mainstream media in France, Mediapart, publishes two recordings in which the famous Benalla boasts of having the full support of his boss, "you're going to have them as he told me, you've always been stronger than them", then discusses ways to get compromising evidence from Macron's party, LREM, under the nose and beard of the police guarding the office. A real mafiosi discussion in a bar in Naples. And then, icing on the cake, Benalla would also have served as an intermediary in a rather shady business with, be careful, "a Russian oligarch close to Putin". The scandal is of atomic proportion. How does the government react then? Has he put the infamous Benalla in preventive detention to avoid any obstruction of justice while finally awaiting his trial, you‘re going to ask me. Well, no, better than that, he sent prosecutors to Mediapart's offices to search them to appropriate the tapes and, above all, to find out where these recordings came from. Search which will also go wrong because it was done without a search warrant. So at least a big scandal in all the French newspapers the next day, you're going to ask me? Well, no, not even and we even see journalists trying to defend this indefensible case. Nobody wants to bite the hand of the person who feeds you. And who feeds these journalists? The same people who put Macron in charge of the French presidency, the French plutocrats. Chances are that Benalla is part of their private mercenary militia, which would explain the incredible tolerance shown by the justice system and the government towards him. A double scandal then: the first, that a close relation of Macron dares to behave out of the rules ; the second, that nor the government, nor the media nor the justice are reacting. What this month of January/February 2019 and its Yellow Vest movement have shown is that the plutocrats and the small gang of mercenaries in their pay firmly hold political power in France, are not about to make the slightest concession to the people and are ready to use means that will bring France close to a banana dictatorship status to remain in power. 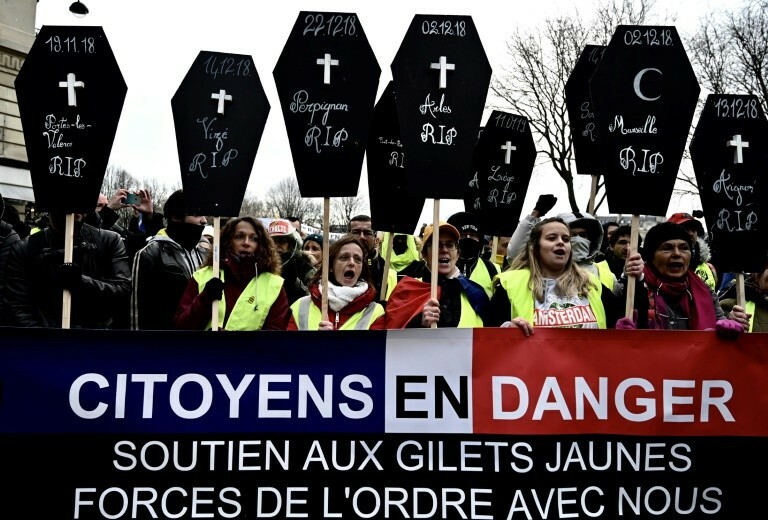 However, the dynamic launched in the population by the Gilets jaunes and the increasingly visible "government by buddies for buddies" of the Macron regime mean that the movement will not be extinguished until it has led to a profound change in the French political system. The French spring will be very hot.